Adhesive weather stripping tapes are designed to provide varying levels of air, water and wind restriction for your mobile homes. Foam weatherstrips and weather sealing tapes cut energy costs and provide comfortable living conditions against wind, weather and other natural elements. Choose from our line of open cell foam for air, pest and light containment or pick one of our closed cell options for heavier duty airtight and watertight weathersealing. We also offer aggressive, hi-tack rubber adhesive or permanent, long-term acrylic. We’ll help you choose the right weatherstrip for your application. All you have to do is peel and stick! 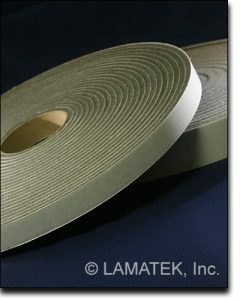 Foam weatherstripping can be slit to your desired width and supplied in rolls of tape or custom cut into individual strips for easy application. Spooling is also available on certain products. Call us today with your dimensions. Foam weatherstripping is available in an infinite variety of shapes, sizes and materials so it can be hard to decipher between them. LAMATEK’s foam weatherstripping tape is a rectangular (or square) profile foam tape as opposed to more rigid “fins” or hollow tube-like weather strips you may find elsewhere.